Get Painting! Live and Online - Paint Big, LIve Big! Do you dream of having a thriving painting life at home? 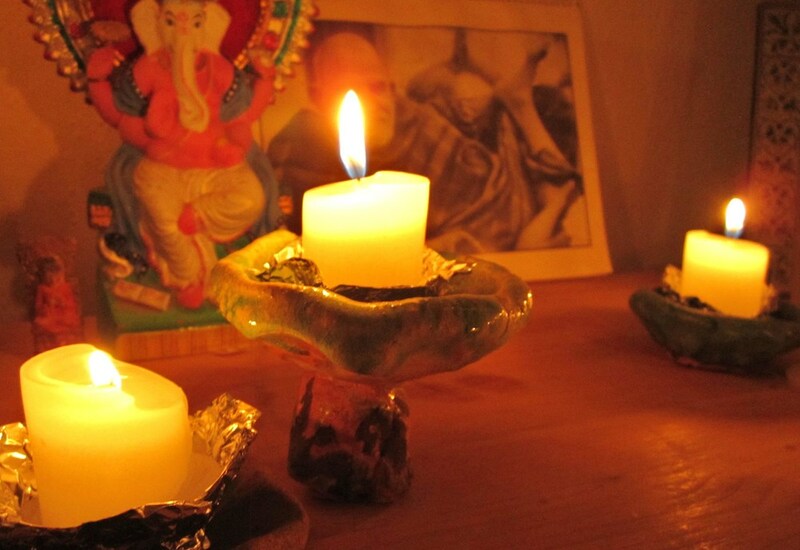 I’m essentially a creativity midwife, and this program is about birthing this dream. Birthing is not about checking something off a list. Your dream of painting is more than that. You want to unleash your creativity and free yourself up from your inner perfectionist. You want to transform into someone who plays, who takes risks with color and shape, who schedules creative adventure into your weekly schedule. I created this Live and Online program when people in workshops wanted to continue painting with me after they returned home. These sessions have evolved organically. Originally I only offered this to people I had already worked with, but I have since found that this partnership also works brilliantly with people I am meeting for the first time. 1. Establish dedicated painting space at home. 2. Enjoy confidentiality in our partnership. 2. Be guided through the process of gathering your paints and materials if needed. 3. Receive encouragement to take small steps of great courage and open up your creative process so you won’t feel stuck. 4. Find new ways to see your work. 5. Receive non-critical feedback on the painting you worked on during the live session and feedback on other paintings you paint between sessions if applicable. 6. Support in lessening the impact of the inner critic and releasing the negativity that can come up when we dare to live bigger. 7. Have a place of accountability. Your commitment is simply to show up. Something always happens when you show up. 8. Not feel pressured to paint in between sessions if time doesn’t allow for this. 9. Receive support in between sessions: You are invited to send Julie emails which she will refer to on your next call with her. It really helps to know you are not alone. 10. Gain a personal sense of inner authority that wasn’t there before. When we paint big, we begin to live big as well. This is what got me hooked. ONE OF THE BIGGEST GIFTS OF THIS OFFER: Creative people often get overwhelmed by their ideas and grand schemes. It can be such a relief to get real with your creative life–which ultimately comes down to scheduling it in and not trying to do it all on your own. 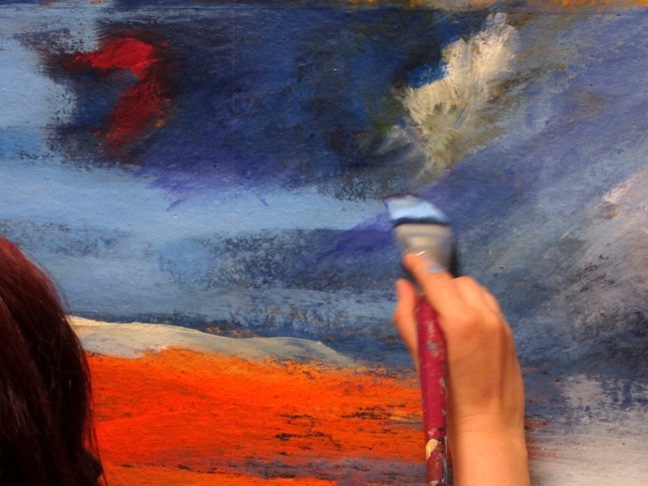 Our sessions will simplify all that–you just show up, ready to paint. That’s it. And I”m serious when I say–try it and watch your painting life emerge– healthy, whole and fresh as a newborn. And after you have completed the program you will have the opportunity to keep collaborating with Julie as you continue to build your painting life. “Working with Julie has been a process of delightful discovery offering elements of surprise, deep understanding, and soulful conversation. Tapping into a process formerly unknown to and unpracticed by me, I learned to approach the canvas with anticipation and curiosity while stepping into the unknown and often receiving visual messages from my subconscious through my own hand. Julie keenly knows how to tap into the personal moment, set the space with clarity and intention, and midwife a creative process that became so meaningful and sacred to me as I worked through personal barriers of the heart and soul. People often tell me that they experience being listened to in these sessions in a way that they don’t anywhere else in their lives. Incredible things happen when you allow for this kind of dedicated space. You don’t have to be sure of yourself or confident about yourself as a painter. Your commitment to show up is what matters most. Being wobbly simply comes with the territory. Beginners and experienced painters welcome. If you can commit to a minimum of two hours every two weeks, you can begin now. Regular art classes don’t turn you on or work for you. You appreciate nonjudgmental, safe space in which to create. You want to intuitively express yourself –you’re not looking to paint by numbers. You have a space to paint in. Garages work, but they must be private for our sessions. You’re able to meet on a laptop or computer or text photos during our sessions. You are able to claim the space to paint two hours at a time in an uninterrupted way. At the heart of this program is the time we spend together. Each session lasts a total of two hours. Have you check-in for a few minutes; How you feel affects your painting time. Have a short dialog about anything you want to discuss– life and/or painting related. It’s amazing how useful these dialogs can be in getting you engaged and present–“ready”. Julie will come up with a personalized mediation for you to start the painting session with based on your check-in and dialog. Paint offline for a specified period of time–highly individualized. Often up to 75 minutes. Come back online together and look at whatever you painted in a kind, nonjudgmental way. This sharing of the process is invaluable. Out your inner critic/saboteur in a lighthearted way so you don’t have to be afraid of it. Share your hopes and intentions for painting or not painting between sessions. Before our first painting session we will discuss what materials you’ll be using, what kind of space you have to work in, and help you situate. These sessions are intimate and deep but also humorous—Transformation requires at least a little laughter! 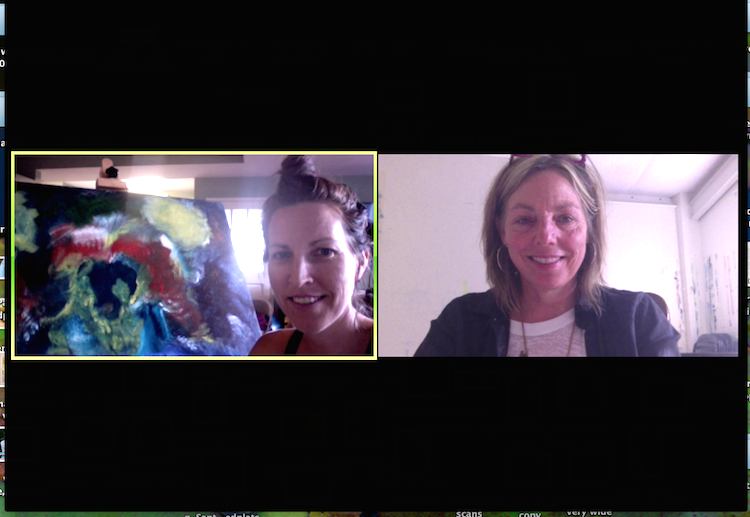 “I have been taking bi-weekly intuitive painting sessions with Julie over Skype now (about 8 or 9 sessions so far over Skype). I have a canvas usually 2.5-3 feet by 3.5-4 feet to paint during a session. It is exhilarating to fill such a big space with my own voice in colors and shapes. What Julie’s intuitive painting sessions have taught me to do is to listen to my inner voice, and to put what I heard in a form, and in shapes without worry or fear. Julie’s encouragement helped me free myself of the need to paint for audience that will grade my painting. In the process, I began to learn how to overcome my fears. I won’t tell you what is good and what isn’t. I won’t give you technical instructions on how to paint. I won’t compare you to other painters. I won’t teach you to paint like me. The joy in this for me is that everyone brings their own unique voice and being to the process. You may paint images, you may not, you may paint in all kinds of different ways. There is no one way here. If you don’t have internet access in your studio, we can meet by phone and you can text pictures of your painting as we go. I am a highly experienced creativity facilitator: Since 2005 I’ve been guiding creative women and men through profound creative experiences, helping them find their own natural creative flow and expression in ways they had no idea was possible. I have worked with people who haven’t painted since they were in elementary school, wannabe artists, and professional artists needing to reignite their art life. I have developed an approach to intuitive painting that I call Paint Big, Live Big! Read here more about my approach. This program includes six two hour sessions spent both one-on-one with Julie and painting in your space. An initial 30 minute consult to help you get oriented.